Almost all machinery need oil to lubricate its components all the time in order to have a long-lasting working life. A lubricant is a substance that reduces friction, heat, and wear when introduced as a film between solid surfaces, such as Machine Bed Ways, bearings, gears and shafts. 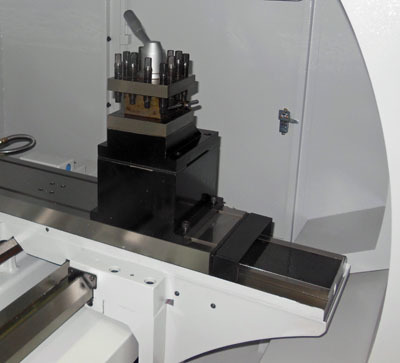 Using the correct lubricant oil helps maximize the life of the machine, therefore, saving money, saving time, and making operations more efficient and more reliable. 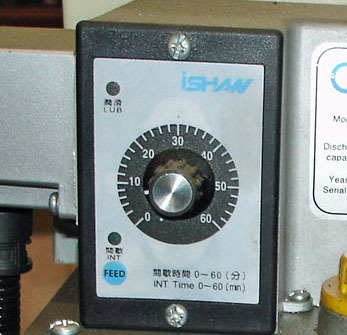 Keeping your CNC lathe lubricated all the time should be One of the Most Important job as part of maintenance routine. 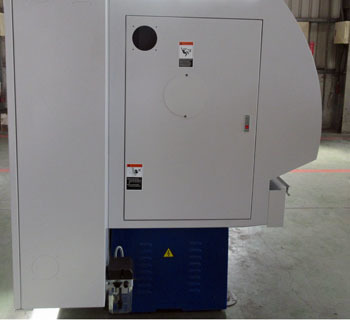 On Lehigh MR-2540 / MR2940 CNC lathe, automatic oiler system is used to provide constant oil lubrication to the cross feed and longitudinal bedways, X-axis and Z-axis ball screws whenever the machine is turned on. 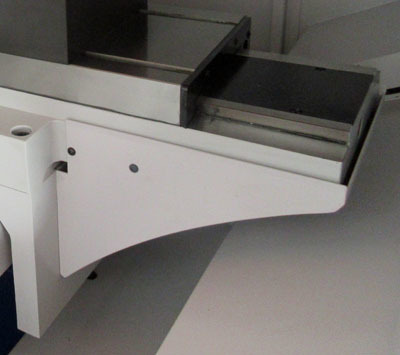 Please add Way Oil 68 lubrication oil onto the small glass container located at the left-hand side of the machine front. You can order Way Oil 68 from Grainger or other industrial suppliers (ISO 68 Viscosity Grade). 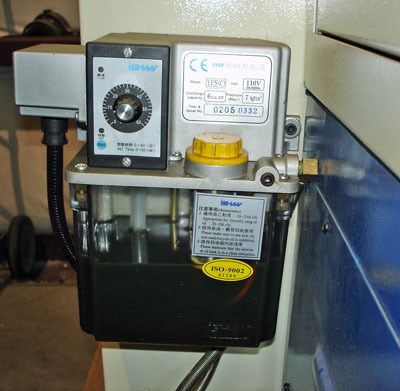 Please note that the volume of the lubrication oil onto the bedways can be controlled by adjusting the TIMER (see the third picture above on right). From this picture, the timer is set around 10 minutes, which means the oil pump works every 10 minutes when the CNC lathe is powered up. 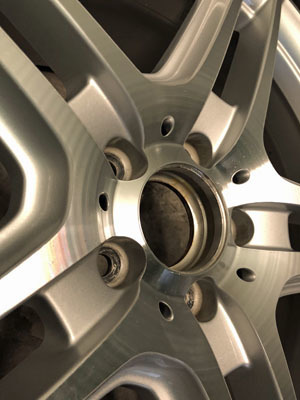 In general, for most wheel shops, you can set up the timer around 30 minutes (at 12 o’clock position). When you have to use the lathe for more than 8 hours a day, then, you should set the timer onto 20 minutes in order to add more lubrication oil to the cross and longitudinal bedways and ball screws on both X & Z axes. 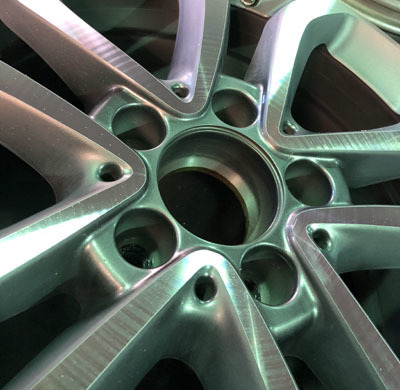 An expensive lesson that some wheel repair shops learned too late is that the automatic oil system on the CNC lathe may not be really fully functional all the time due to lack of maintenance. 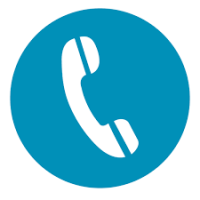 Many operators simply assume all is well if the alarm does not go off. When the oil level is not really low for a long time, the automatic oil system has stopped working without the notice. 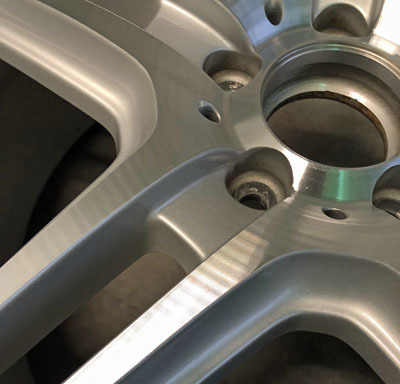 In that case, the surfaces of the machine bedways become very dry and eventually causing the poor finishes on the machined wheel surfaces as shown in above pictures for Wheel Sample #1 to #3. These noticeable poor finishes were caused by the lack of oil lubrication on bedways. For this reason, it is very important to check the automatic oiler once a week for its normal function as part of the maintenance. 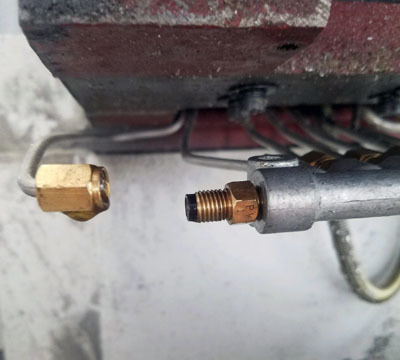 The simple test to verify the function of the automatic oil system is to turn the timer onto the continuous mode (0 minute) for a couple of minutes. Then, you can check on the bedways for really fresh oil drops coming from auto oil system. If YES, then, that is working well. 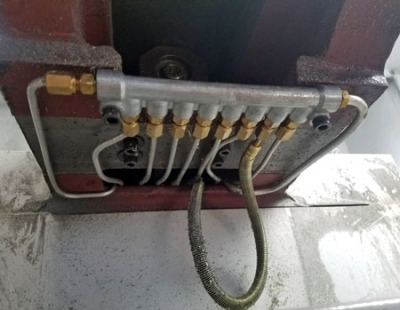 If NOT, then, it is necessary to verify the oil pump function first at the oiler by removing the flexible hose in order to see the oil flow from the oil pump. 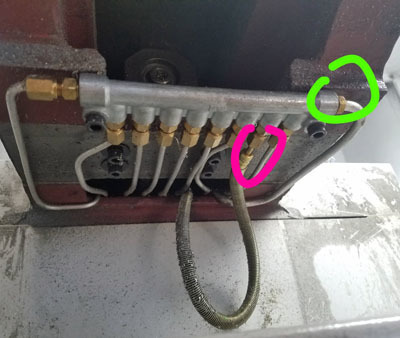 If the oil is flowing out there, then, continue to check the distribution terminal of the oil hose and all oil valves, which are located in the front of the lathe as shown in the pictures above after removing the sheet metal cover. 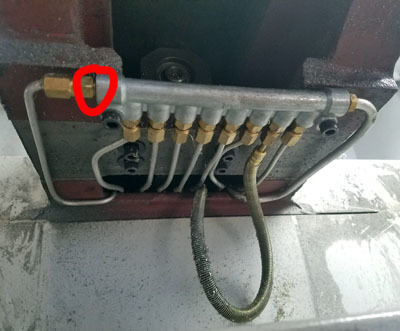 From the oil distribution terminal, you can see where the flexible hose is connected (see picture below circled in purple color) and other oil control valves, which are providing lubrication oil to different components of the CNC lathe. So, it is very important to verify all the valves are working correctly in order to provide oil lubrication to all these components.